BATTLEGROUND came out at the end of 1949, about a month before Sands Of Iwo Jima and Twelve O’Clock High. 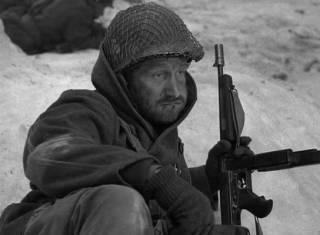 It was the first big-hit combat film about WW2 since the war ended in 1945. There had been a regiment of movies about the war during the conflict, but they dried up pronto after VJ Day. A slew of the best came out in 1945 (Objective Burma, A Bell For Adano, The Story of G.I.Joe, A Walk In The Sun ) but by then the public was tired of the fight onscreen as well as the increasingly ferocious real thing and none of those were in the top 20 moneymakers of the year. The last biggie, They Were Expendable, under-performed as well, leaving studios and audiences to concentrate on the sour film noir cycle in the postwar psychic hangover. Everyone went to see The Best Years Of Our Lives, but it dealt with the bitter aftermath, not the fighting. Entries like Command Decision and Task Force beat this to the gate, but even with Gable and Cooper they still didn’t bring in much of the crowd. This ‘everyman’ G.I. saga broke open the ammo locker for the genre, and did it with a smart script, thoughtful direction, scant baloney and a committed cast. It’s about a platoon of the 101st Airborne, during the Battle Of The Bulge. 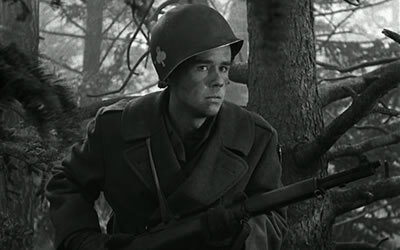 That in itself is of note, as the month-long struggle was the biggest, most casualty-costly action in US history, yet only a handful of films have dealt with it, notably the spectacular, accuracy-backwards Battle Of The Bulge that clanked across Cinerama in 1965, a segment of Patton five years on, and more recently two episodes of the terrific mini-series Band Of Brothers. This MGM winner got there first, and has stood the test of time quite well. 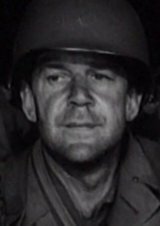 William Wellman was the director, actual Bulge veteran Robert Pirosh wrote it (he later developed the classic TV series Combat ). Silly subplots were out, cheap sentiment left elsewhere. Atmosphere is put over with realistic sound effects and crisp photography of superb fog simulation on excellent sound-stage sets that don’t betray themselves. Fighting itself is relatively minimal, but the conveyed tension is such that when there’s a scene of desperate hand-to-hand combat, the actual deaths are out of the shot, but their viciousness comes through. Before the days when moviemakers soaked you in gore, directors who knew their stuff could abide with the restrictions of the Production Code and still shake you up sufficiently. The cast is a mix of the studio’s second-tier fellas like Van Johnson and John Hodiak with newcomers like Marshall Thompson and Ricardo Montalban, all in top form. Douglas Fowley is memorable as the guy with the clicking false teeth, and James Whitmore came across so well as the ‘Sarge’ that he got an Oscar nomination for Supporting Actor. Pirosh copped a statue for his script, as did Paul Vogel for his b&w cinematography. Other nominations went to the Picture, Director and Film Editing. A huge hit, number #2 for the year, taking in almost $13,000,000 worldwide. 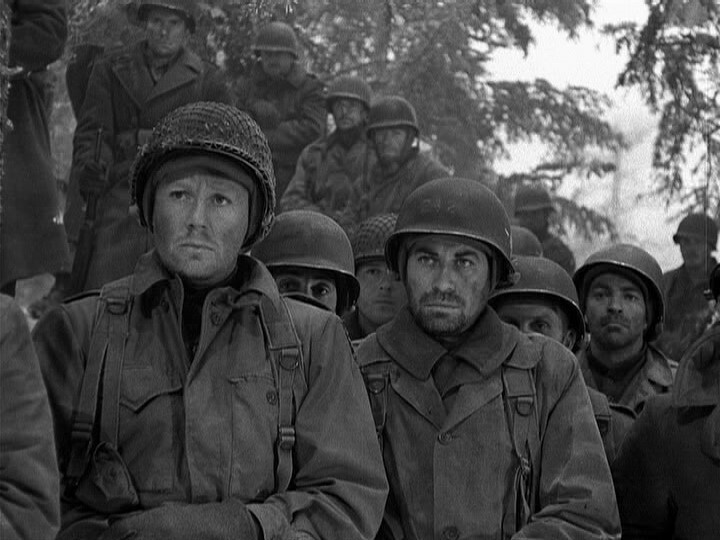 Previous war movies were usually rah-rah that played softball not just with the action scenes (mowing down battalions of clumsy ‘Krauts’ and sneaky ‘Nips’) but in depicting our guys mostly too-good-to-be-true, with the odd bad apple who soon saw the light. A few years later and war movies would highlight the spectacle. This one is about recognizable people—scared, brave, annoying, clever, dependable, sneaky—fused together in a miserable situation that happened to be a shooting gallery. I think maybe audiences made it a hit partially because these guys acted like people they knew. I mean, really now, who had a neighbor like Errol Flynn? A dramatic, suspenseful, moving tribute, also featuring George Murphy, Jerome Courtland, Denise Darcel, Leon Ames, Richard Jaeckel, Don Taylor and James Arness. 118 minutes. 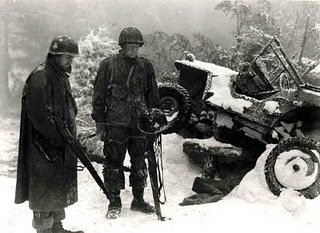 Note: During the Bulge, 19,000 Americans were killed, 47,500 wounded and 23,000 went missing or were captured. A bleak Christmas for many families, to say nothing of the hapless Belgian civilians and 100,000 German soldaten. Doug Fowley, he of the clacking choppers, actually lost his in an explosion on his carrier in the Pacific. I met the late Mr.Fowley when he guest-starred on Lassie in the 70s (my b.in-law was starring). What a great old guy, filled with stories from Golden Age Hollywood. I’ll bring on one of his best anecdotes when I get around to Dodge City.